Her question was natural, but only in context. We were in Japan, where having a bath or shower before going to bed—i.e., after work or school, and at the end of the day, not the beginning—has been the traditional norm. So, when Tiris, a student traveler and a Japanese studies major from China staying at the same forest guest house as I in Furano, Hokkaido, asked me, “Aren’t you going to have a shower (at 8 PM)?”, I was only half surprised, mostly because I never start my day without a shower and, conversely, end it with one only when I’ve been doing something to actually warrant it, e.g.,after a grinding, sweaty bike ride. That emotional mix got me thinking: Why does anyone insist on or strongly prefer having a shower or bath before (or after) work, rather than after (or before)? Like most personal preferences and policies, this one is likely to reveal a lot about the individual, the lifestyle or the culture in which it is embedded (and maybe even the technology employed), and may even be used as a “diagnostic” to assess work-life balance and optimization. It also made me wonder whether or not there is a better argument for before (vs. after) or after (vs. before). That would mean that some individuals or cultures have ritualized a mistake, at the expense of a superior bathing experience and reason. Moreover, if the timing of bathing (shower or bath) in any way influences work performance, work motivation and impressions created at work, any argument or evidence favoring before or after work bathing warrants consideration of itself and of the wisdom of changing one’s bath time. Now, in general, the Japanese are at least as intelligent as the rest of us; so is it not possible that they know something we don’t, that they have been on to a better idea for centuries—namely, bathing after, rather than before going or starting to work? —A shower or bath late at night will wake me up when I’m getting ready to sleep. That’s because, for me, a shower is stimulating, not relaxing. 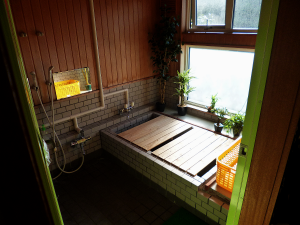 Baths take too long to prepare and complete, waste water and leave a dirty film, unless it’s Japanese “ofuro” style, in which, traditionally, there has been a separate space and drain for a very thorough bucket body-wash and rinse before a soak in the tub a soak, which traditionally was communal. —A stimulating shower before work energizes and catalyzes it. —The period of maximal social exposure justifies maximal grooming effort. That’s usually after I go out, not after I come home. —I don’t get tired, period. So, I don’t need a “soothing” soak, just as I don’t need relaxing meditation. —A shower or bath after I’ve finished work, but much earlier than bedtime, would disrupt my recreational activities. Having made what is a prima facie case for before-work showers (or baths, if you must), I have to ask why anyone would shower only after work or before bed (while saving the most compelling reason for last, below). —”Soto” contamination vs. “uchi” purity: It is well known that the Japanese fastidiously adhere to the distinction between “soto” and “uchi”—”outside” vs. “inside”, with insider groups and insider space being both superior, purer and sacred, compared with outside individuals, groups and space (including outside(r) cultures and countries). This is one reason for the endless Japanese switching from shoes to house slippers to toilet and bath slippers and back again. Almost nothing horrifies the Japanese more than bringing “soto” dirt and grime into the “uchi” space of a home by keeping one’s shoes on. Since there’s more dirt, grime, contamination and sweat in the soto external environment than in one’s freshly aired uchi futon, it seems logical—in general, as well as to the Japanese—that the time for cleaning is after work, not after sleep. Because the Japanese have pre-existing negative perceptions of things that are soto, this factor is likely to weigh heavily in their calculations regarding when to bathe. Accordingly, it is reasonable to predict that a Japanese white-collar worker returning to his uchi home from his soto work will feel far more contaminated than his American counterpart, and will, therefore, as a matter of course, have a nightly bath or shower. Of course, this negative anti-soto-bias does not account for those American white-collar workers who prefer to shower at night instead of (not in addition to) morning, unless their work or day environment makes them feel especially contaminated, for other reasons. —Deferred vs. immediate gratification: This is only speculation on my part, as is the uchi-soto connection, but it’s worth considering whether our Western emphasis on immediate gratification, e.g., fast food, fast elevators, fast credit and fast deals, doesn’t manifest itself in our bathing preferences, among those for whom showers and baths are gratifying. This would be in contrast to the diligent, self-sacrificing, stoical Japanese who traditionally cautiously saved, sacrificed for the company, postponed or gave up holidays, studied far more than they played (until they got to university) and avoided impetuous relationships—all as forms of deferred gratification. Given the Japanese near-reverence for luxuriating in their “o-furo” and hot spring soaks, forgoing bathing in the morning in order to battle crowds and traffic early enough to make it to work on time, or, even better, early, would fit in very nicely in a culture in which self-sacrifice has traditionally trumped self-indulgence. By the same token and like the tea ceremony, a bath is not just about mixing hot water with some other stuff in a hurry. The duration and detail of a Japanese bath is prodigious, and therefore, it may be that as a case of “Do it right, or not at all”, Japanese bathing—especially the bath—is postponed until the most propitious and ample time: night. a link in a chain of “operant” behavior (which is performed for a reward that follows it) linked and leading to work, its completion and eventual reward in the form of a paycheck. It is the latter role the morning shower can play as an incentive that distinguishes it from the Japanese after-work shower reward pattern. —Long work days and long commutes: It is also reasonable to conjecture that people who have a combination of long work days and long commutes will of psychological and logistical necessity end up having night baths or showers. I’ve always been able to avoid at least one of these two conditions and therefore can “afford” a morning shower. The reason the combination works against morning bathing or showering is that a long work day frequently means fewer hours for sleep, which in turn necessitates a trade off between sufficient sleep and bathing/showering. It would be interesting to statistically investigate the bathing habits of Japanese office workers and teleworkers, who never have to commute or be up at a specific time, to determine the respective percentages of after-work-only bathers. —Technology: Because the traditional Japanese village community or home bath was much larger, being more like a very deep, often large hot tub than our modern mini-tubs with their plentiful, abundant and mechanically-supplied hot water, it’s easy to imagine that heating one took a lot of time, a lot of wood and very, very early rising by somebody to heat it up if it were going to be used by, say, very early rising farmers and heated to the 40+ -degree Celsius levels that the Japanese insist on (as opposed to the maximum of 38 degrees I, and probably you, can endure). Buttressing this personal Japanese insistence on high temperatures in winter and in general is the public health consideration that because communal bathing (of the sort still practiced in the “sento“—public baths) is a great breeding ground for bacteria and viruses, the Japanese government long ago mandated that the temperatures be maintained at 42 degrees Celsius—5 degrees Celsius higher than normal body temperature. Faced with such temperatures, I too would favor evening bathing, but only to postpone it as long as possible. Hiroyuki Shimura, an international biker bound for Europe, staying at the same biker guest house I stumbled upon, confirmed that because traditionally Japan homes had no central heating, the brutal winters could best be countered with long hot soaks before bed to warm up for the inactive period of sleep. To this it should be added that the evening was traditionally—and remains—the only time everyone in the family could leisurely bathe at the same time without having to rush off to work or school. Hence the combination of limited home heating technology and frigid winters entrenched the ultra-hot evening bath in Japanese culture. Technology and climate collaborate in summer as well, given the intense summertime humidity and high temperatures typical in much of Japan. Shimura said that the stickiness and sweat of the work day has got to be dealt with after returning home from work. To this must be added that the Japanese custom of wearing full suits well into the summer only intensifies the need for a bath after work. So, it would seem logical to postpone access to a bath until late in the day—which, like many customs and traditions, has persisted, even though the technology that necessitated it has been replaced. Compare the case of “three-squares a day” as a persisting American meal regimen, which made good sense when more than 5,000 calories a day had to be expended by colonial American farmers working their fields, because the limitations of the then existing technology made brute, physical manpower essential. The evening bath may be another such cultural and technological anachronism, except for one more argument in its favor—and the one I regard as perhaps te most compelling reason to bath upon returning home, rather than the next morning, for anyone who works outdoors in fields, meadows or forests: disease prevention. 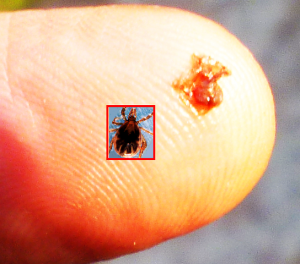 A few weeks ago, I was bitten by what was identified as almost certainly a tick (shown in the “after” photo with a stock photo for comparison) while seated in a forest cabin-side chair, reading a book, in what I later discovered is apparently a Japan epicenter of endemic, potentially fatal Lyme disease, Hokkaido. Thanks to some luck (exposure of only seconds, rather the 24-hours of tick gorging that is very likely to transmit the bacterium) and immediate medical intervention (including antibiotics and immediate disinfecting), I am apparently fine. However, part of my emergency and general tick education included noting the medical advice to thoroughly shower and scrub immediately after returning from any outing in woods, grass, etc., where ticks dwell, especially since some of them can be invisible to the naked eye. For anyone who works or walks in or near woods and high grass in Lyme country, I can’t think of a better reason to do that immediately upon returning home and not waiting until the next day. Even if you are Japanese. Note: Hokkaido and the world’s other wilderness areas are well worth visiting; just take proper precautions—especially with children and pets—when in or near forests, high grass, fields and meadows. Consult your physician in advance of a trip anywhere there is suspected or confirmed Lyme disease or other tick-borne illnesses, as a wise preparatory step and, of course, seek immediate medical advice and treatment, and consider preserving the critter for lab examination (after following expert advice on removal).